Union and Confederate naval forces collide near the Mississippi River town of Johnson’s Bend, Missouri. 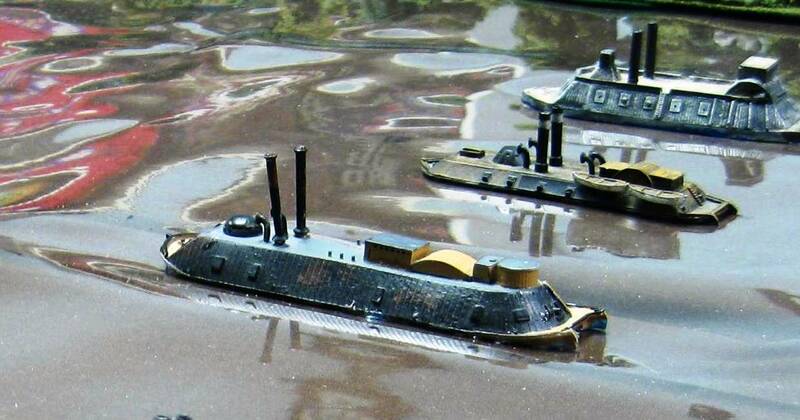 Ironclads thunder away at each other while speedy Rebel rams look for an opening to slice open the hull of the enemy craft. 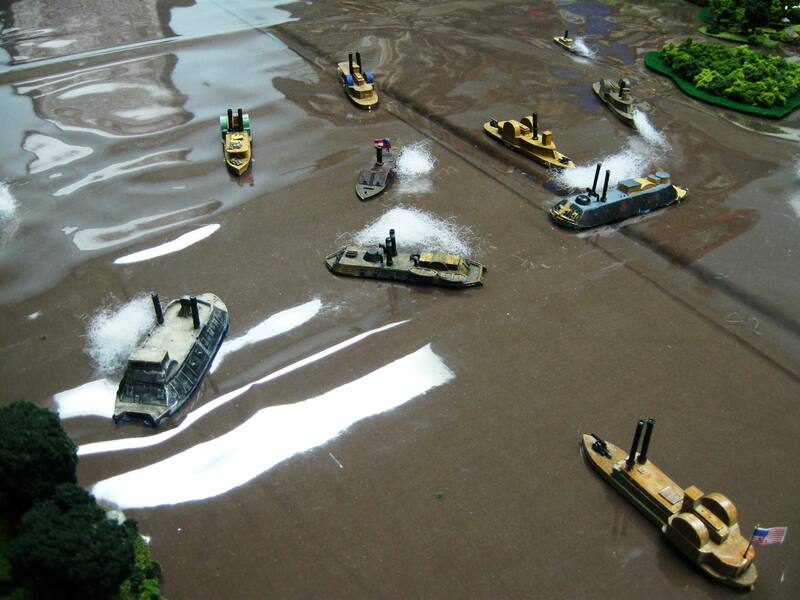 A Rebel cottonclad fires its forward gun at the oncoming Union gunboats as the action heats up. Off on the western riverbank, a five-gun Rebel fort adds its firepower, sending a Yankee ironclad to the bottom of the Mississippi. 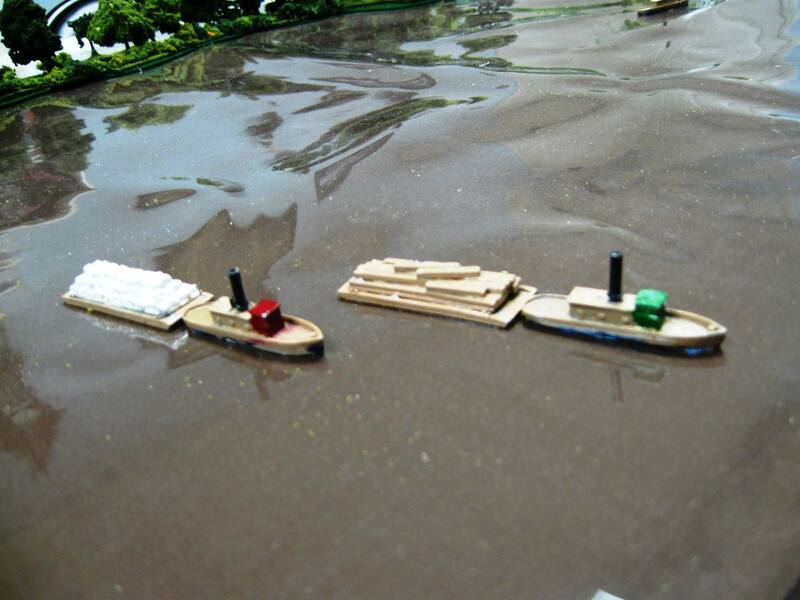 The Yankee fleet prepares for action and begins to maneuver into favorable positions to “cross the T” and let loose powerful broadsides at the Rebel vessels. The USS Benton blasts away at the CSS Arkansas, which will lose its rudder and begin to circle helplessly. The USS Tyler will finish her off. 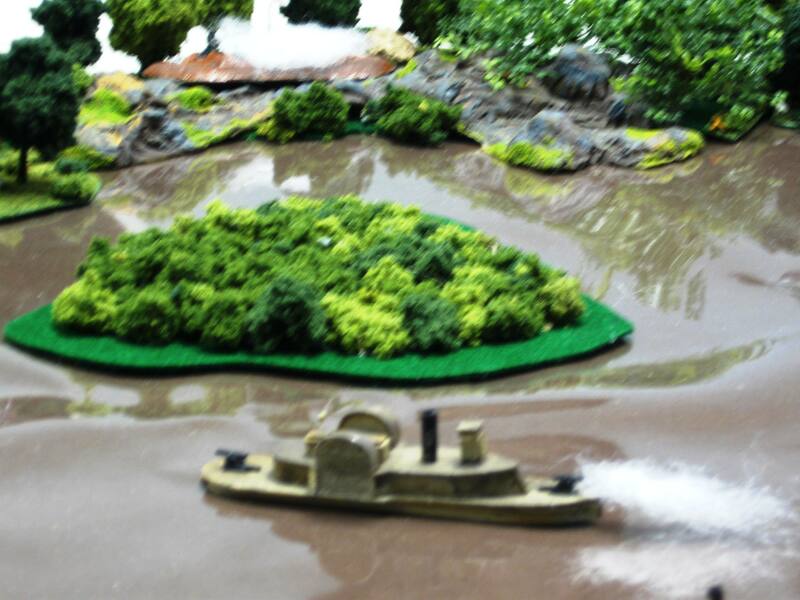 Two Rebel tugboats manage to slip away with their barges full of cotton and sawn lumber. 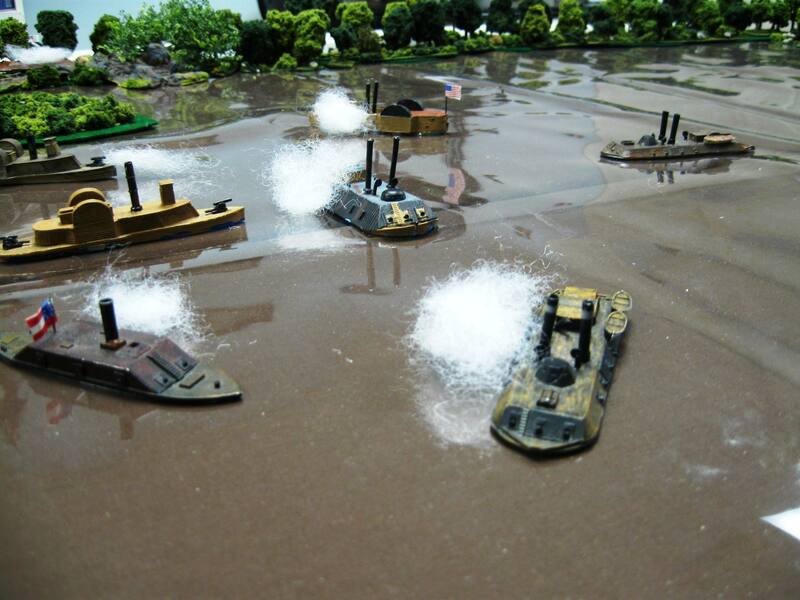 However, to unarmed river steamers loaded with additional cargo are set on fire by the USS Cairo and USS Carondelet. Despite their best efforts, the Rebel fleet fails to protect the wharves and docks at Johnson’s Bend, as well as the heavily laden river transports. Great looking table! What surface are you using? It looks like a brown cloth — but what is the shiny stuff? 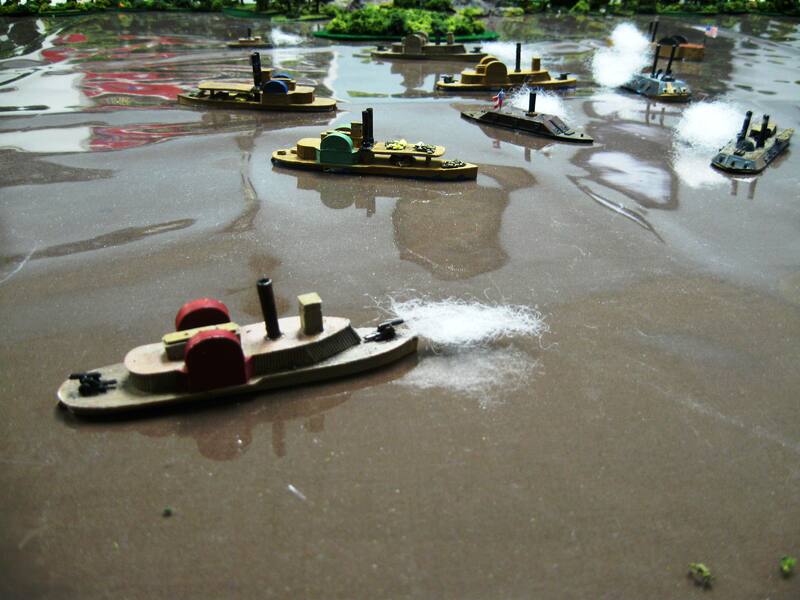 I am running a Smoke on the Water scenario at Huzzah! and would love to do up a table like yours! See you at Huzzah in Maine! The base cloth is a piece of brown cottonade cloth I picked up at Wal-Mart and the “water” is a 4-foot strip of clear vinyl also from Wal-Mart’s fabric section. It makes a decent looking Mississippi River. Thanks for the quick reply. I will pick up some of that vinyl stuff. And I am looking forward to seeing you at Huzzah! coming up soon!